You know what I want right now? Cake. I want that piece of mouth-watering cake! And you what I can’t have right now? Cake! I’ll tell you what works for me – cold cut off. There are people who say that you should allow yourself to indulge in your favorite junk food once a week. As long as you’re eating healthy all other days, one day is absolutely fine. You know what that 1 day does to me? It re-introduces me to the delicious taste of junk, and I’m hooked again. In addition, because I have been deprived for so many days, my taste buds want to overcompensate by going overboard! This method definitely does NOT work for me. It makes it WORSE. 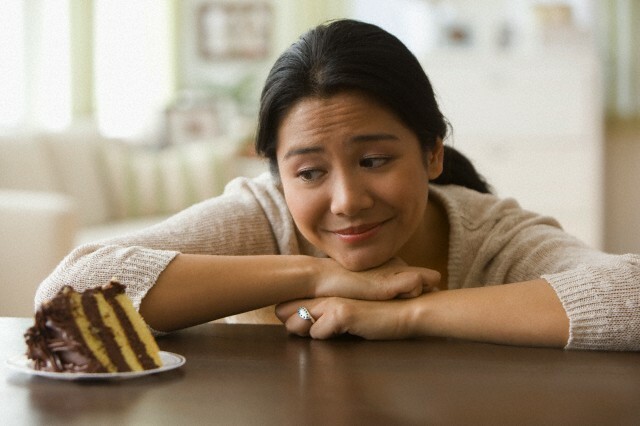 No junk food – please, don’t eat that pastry today. And no, drop that packet of chips. And yes, biscuits are also considered junk food! Honestly, stick to as much ghar ka khaana as possible. And always opt for freshly prepared food (even in the office canteen) over processed and packaged food. So, yes to that pasta and no to Maggi. Yes to cold coffee and no to Tropicana fruit juice. IN PROGRESS This is the hardest one for me because most of my diet over the last 5-6 years has been junk food. Since I am blessed with a high metabolism, I have always eaten anything and everything without giving it a second thought. But a flat stomach is not possible without cutting on junk, so I am trying in earnest to limit my junk food intake as much as possible. No caffeine – difficult for most, but there’s 2 reasons to find an alternative for your morning cuppa coffee or tea – #1 you are unknowingly introducing too much sugar to your diet because of the spoonful of sugar you add to your cup atleast 3-4 times a day. Wouldn’t you rather satisfy your sweet craving with a bite of chocolate? #2 it stains your teeth. Don’t believe me? Try not having tea/coffee for a month and you’ll see the difference yourself. CHECK! Tea & coffee-free for four months and loving it! For a flat stomach / abs – there are a few basic rules = don’t have junk food, if you must then never have it after sunset (since your metabolism is at its slowest then), never have a heavy dinner (if possible, try having it before 8 pm), always have a big breakfast, stop eating egg yolks (just the whites), 50 crunches daily, do a workout that makes you sweat (Cardio) and limit your salt intake (because it causes water retention in the body that causes bloating). For toned arms/legs/shoulders/back – You cannot attain a truly toned body without weights, or anything that gives the same kind of impact on your body as weights. In case you find dumbbells difficult to handle, do workouts that involve using a medicine/gym ball or elastic bands. I’m no expert at this, but it appears to be common sensical. JUST STARTING OUT I’ve bought a medicine call, and I have light dumbbells, but I rarely use them. Eat every 2 hours – I’m sure you’ve heard this a million times. But, it’s true. The reason why it works? Let me explain this to you through an example. Imagine you ate a big breakfast at 8 am. That’s great. You reach office, have tea, start working. You eat lunch at 1 pm. That’s a FIVE hour gap between two meals. Your body gets used to this routine and ends up doing this – storing fat in in order to release energy during the 5 hour gap. Instead, if you eat every 2 hours, the body knows it doesn’t need to store any fat because you’re keeping it well-fed at all times. CHECK This comes extremely naturally to me, but I’ve seen how easy it is for people to change this habit. Just eat smaller meals every 2 hours, it’s truly easy and body-changing! No more white – No white rice. No white bread. They’re both just empty calories – which means, only calories, no nutrition. Which is pretty pointless. Instead, opt for brown rice (which is essentially rice that has been boiled with the chhilka/cover on it, so that Vitamin B gets absorbed into the rice grain) and for wholewheat bread (not even brown bread – because sometimes it’s only white bread that has had brown coloring added into it, and wholewheat has fibre as well). Be aware that brown rice takes longer to cook, and it doesn’t feel as soft and mushy as white rice. But honestly, who doesn’t like a change? 🙂 CHECK We only get wholewheat bread delivered to the house, and I eat white rice only when I’m eating biryani, which is not often. Are you trying to get yourself fit/lose weight before the wedding? Which part of the plan is most difficult to stick to? I am not gonna be a bride but I am trying to cut down on the tummy!!! I have been taking tea very regularly just coz I need something to munch on…have to cut that and yes, no white rice and bread. I also take only egg white. my mom warned me against yolk few days back only. and, my dinner is not exactly less but it feels light on the stomach with more of yogurt. oh yes, take more of yogurt. its good. and, yes, less salt. Definitely gonna start yoga. Stop tea. Start crunches. Stop brown bread and start whole wheat bread. Rest I already follow. Thanks. You have done an amazing job. I have 5 months left to my marriage and I am going through all the posts. Next article The Indian Groom’s Dilemma – To Propose or Not To Propose?